As I set at my desk, listening to the sound of heavy rain pounding the roof in a relaxing rhythm, I’m considering a statement posed by my neighbor’s 11-year-old son – ”Mr. Gar, when we all watch baseball the guys way out on the grass just stand around during the game waiting to get to go to the dugout and bat.” It suddenly occurred to me that maybe the outfield’s contribution to team victories are totally misunderstood by the fans. Watch for OF Tyler Baumgartner this year! 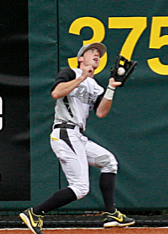 First, outfielders are generally the better athletes on the Ducks’ baseball team because they must run well with speed and quickness, have excellent hand eye coordination to function effectively on catching the ball, display great concentration in staying alert to successfully perform their defensive assignments plus they always possess the strongest throwing arms on the field. Routinely, a ball hit to the outfield is returned to the pitcher with a short throw to an infielder, who has moved out to accept the throw. However, with an opportunity to make a possible play on a runner the outfielder must have a strong throwing arm to make a 200-foot throw to any base or cutoff man. The action described below is a perfect example of an outfielder’s contribution to the success of the Duck baseball team. The Ducks are on the road, the opponent is at bat with 1 out in the bottom of the sixth and the game is tied at 3! 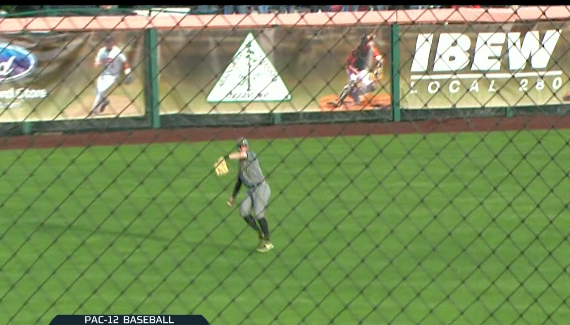 The count is 2 balls and 1 strike with Ducks’ Junior right-hander Darrel Hunter pitching well in relief. 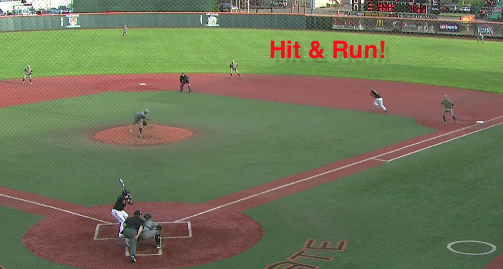 The opponents have a runner on first as the result of a solid single to left center from the previous batter. In baseball the 2-1 and 2-2 pitches are often referred to as ‘action pitches;’ the hitter is said to be ahead in the count as the pitcher has, at this point, but one pitch he can waste, while the hitter has at least two pitches he can look at. Thus the pitcher is forced to throw to the strike zone, which enhances the hitter’s probability of making good contact with the ball. The 2-1 Pitch Starts the Hit and Run! This Hit and Run is designed to take advantage of a given set of movements required by the Ducks’ defense. 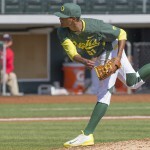 The hitter is right handed, thus the shortstop is required to remain in normal fielding position and with a runner advancing to 2nd base, the Ducks’ 2nd baseman, Junior Aaron Payne, is responsible for covering the bag to receive a throw from the catcher to prevent the runner from stealing second. To the Ducks’ opponent the area between 1st and 2nd base is then left undefended and any ball hit to the right side of the infield will produce a base hit allowing the runner, who left 1st base with the pitch, to advance as far as 3rd base at a minimum and often, with base running skill, even score. 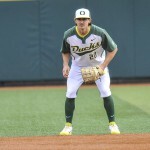 However the Ducks’ pitcher, Hunter, with excellent control, uses one of the two defensive moves the Ducks have to offset the opponents’ offensive advantage. He delivers a breaking pitch up in the strike zone just below the letters. The batter must swing to protect the runner, however, due to the location and type of pitch, he is unable to hit the ball on the ground and actually hits the ball on the fly to deep left center. Thomas, with excellent technique, makes the catch. 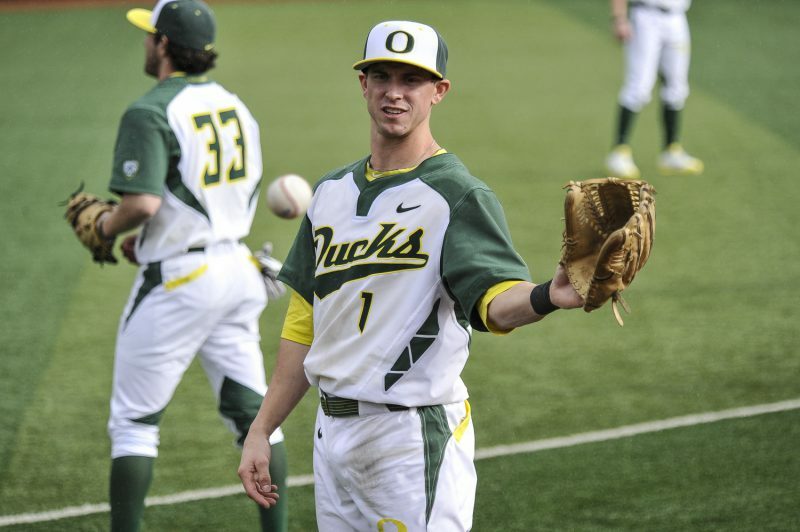 The Ducks’ left fielder, Senior Brett Thomas, being well coached, runs to the place on the field where he will catch the fly ball and, having caught the ball with both hands on his ball glove. Thomas is able to make a quick, sure transfer of the ball from his glove to his throwing hand. The runner, until he is able to return to first via a re-touch of second, is in jeopardy of becoming the 3rd out of the inning. Since the runner is forced to return to first base, and retag before he can advance, tagging the runner with the baseball is not required to effect the put-out. 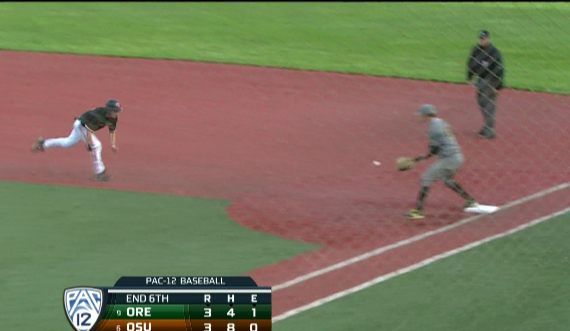 All the Ducks must do, to turn this routine fly ball out into a double play, is get the ball to the 1st baseman and have him put his foot on the base, before the runner is able to get back to that base and touch it himself. 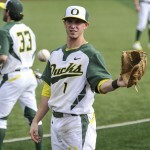 The Ducks’ left fielder Thomas, displaying a strong throwing arm, sends a long, strong throw to the first baseman with one intended and controlled bounce off the base-path thus effecting the 3rd out of the inning and ending any scoring threat the opponents were attempting to generate. 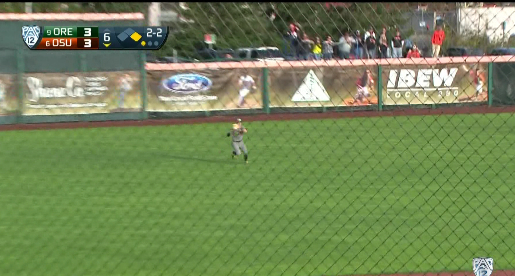 The Ducks went on to win the game 6-3 thanks to the strong throwing arms of the Duck outfielders.